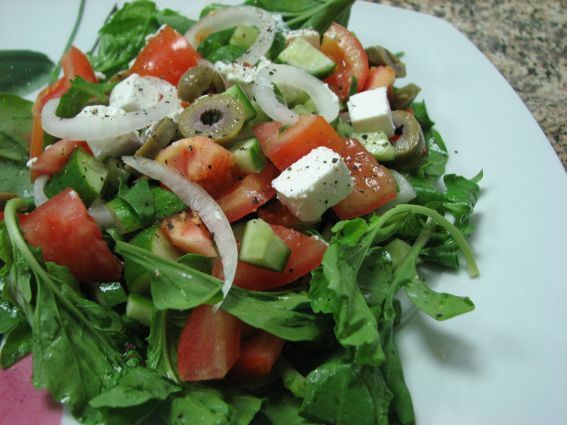 This is a great traditional salad one of my favorites. I suggest you whiz up the dressing in your blender as you can store in a glass bottle if you make more then you need. Actually this dressing goes well on just about any salad. You may want to use dried tomatoes instead of fresh and I recommend letting this salad marinade for a couple of hours before you serve and eat it because the dried tomatoes soak up the dressing and taste really yummy. Add pepper and salt to season and toss thoroughly. Sprinkle the delicious feta cheese all over.